A recent study just came out about the 10 places where travellers are most likely to get food poisoning. No one wants travellers’ tummy, but it’s good to know that you’re covered by travel medical insurance if you do catch a stomach bug! If you’re planning on travelling abroad this year, take note: some places are easier on your stomach than others. Half of vegetarians don’t trust foreign food to be truly meat-free. One quarter of travellers consider food an important factor in choosing a destination. 37% of vegetarians reported seeing MEAT in their food while abroad. 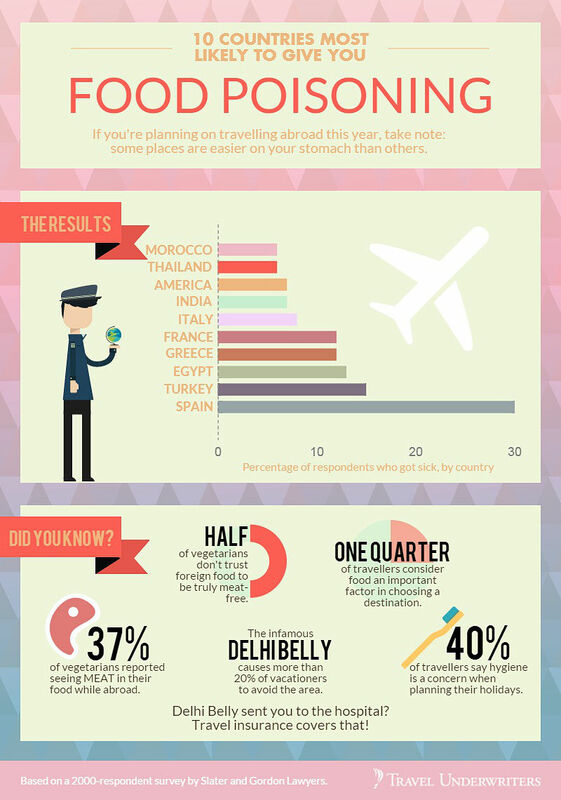 The infamous Delhi Belly causes more than 20% of vacationers to avoid the area. 40% of travellers say hygiene is a concern when planning their holidays. Delhi Belly sent you to the hospital? Travel insurance covers that!